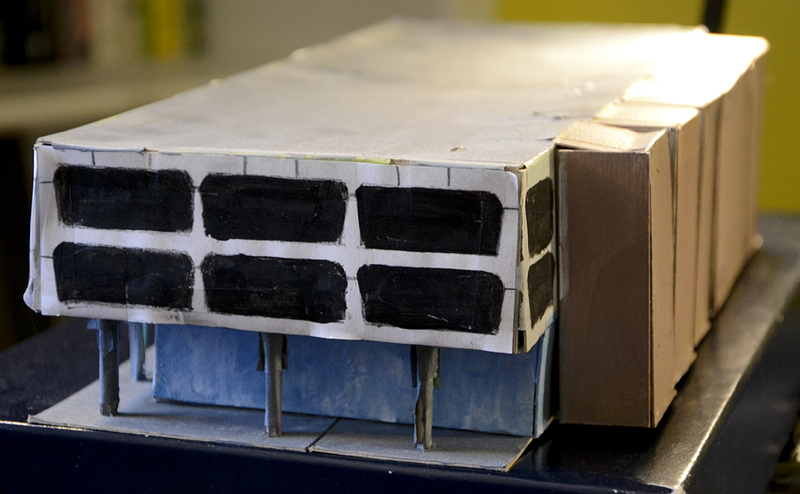 This is another modelling project whose inspiration goes way back to my childhood in the late '70s and early '80s. Growing up in Canada with a Macedonian cultural heritage, the main meeting place for us was St. Clement's Orthodox Church in Toronto for various functions: weddings, Christenings, and many, many dances (outside of Christmas and Easter, we didn't attend regular church services, nor did my parents insist that my sister and I go to Macedonian school). 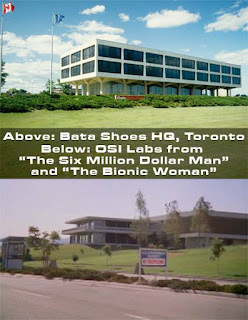 I bring that up only because more than 90% of the time we would pass this building on our way to and from church (and the dozen or so times I'd visited the Ontario Science Centre just around the corner from Bata HQ) –otherwise, I might never have known about this relatively short-lived gem. Heading west along Eglinton Avenue (just east of the Don Valley) I'd see the this strange and beautiful building before we turned left onto Don Mills Road. Waiting for the light to change I'd often have ample time to admire this lovely, unique, futuristic, bright white thing (the view below is how I'd see it from the road). I would wonder what "Bata" meant and, early on, mistook it for a certain building from a couple of favourite current TV shows (I wasn't able to compare them side-to-side, so, to my seven--or-eight-year-old eyes, the one blocky building on a grassy hill easily resembled the other). 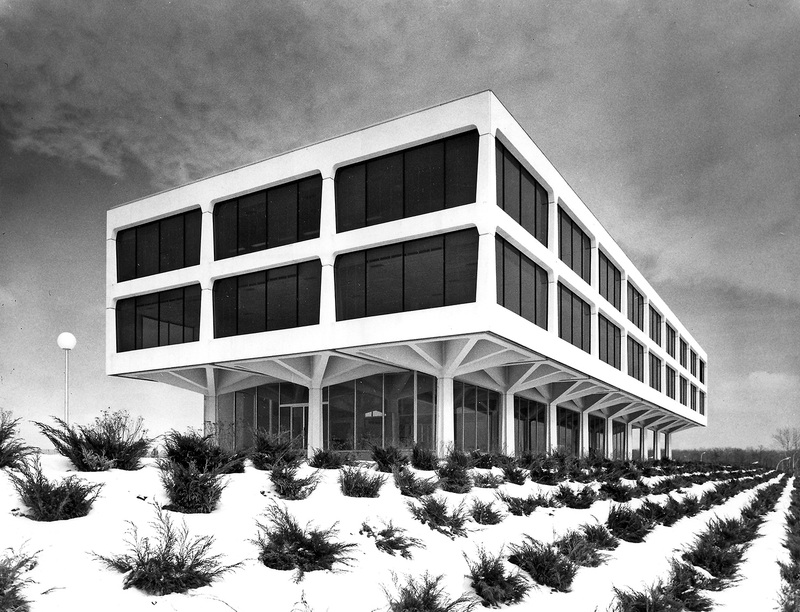 Designed by architect John B. Parkin and completed in 1965, it graced that hill for decades, but barely got to see the 21st Century; it was demolished in late 2007 to make way for the Aga Khan Museum (which was completed in 2014). Toronto Star architecture critic Christopher Hume said around the time of its demolition: "Surely there's an element of irony when an architecturally worthy building must be destroyed in the name of culture." "Situated on a height of land in Toronto's north end, the simple, modular edifice exemplifies the ideal of the building in a park. Simple and seemingly weightless, it rests on rows of columns, reminiscent of an ancient Greek temple. Unadorned yet poetic, the architecture pays homage to the past while extolling the virtues of the future." Around 2010 or 2011 I was looking around on Google maps and wanted to have a look at this building from the aerial view that application afforded –and that's when I discovered it was gone! I hadn't been in that area for years, so I never had an idea that it was demolished and replaced by something else. 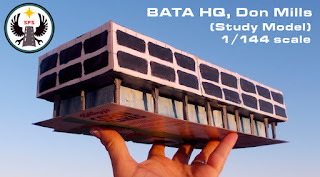 When I returned to model-making in 2015 and eventually started thinking of branching out beyond spaceships and cars to include scratch-built architectural projects, this building was the first on my list. My plan is to build this in styrene as part of a diorama including the grassy hill and accurate landscaping...and maybe even lighting the offices if I can find suitable reference images. But first I'd have to build it with simple and cheap materials (cereal box cardboard and masking tape) to get a handle on the measurements and scale (which, to make the project manageable, would be 1/144). Since the building doesn't exist anymore, I had to scour the internet for reference images, and managed to collect quite a few, but nothing showing the roof, so that'll have to be creatively extrapolated. I never saw the back of the building in real life (even when I worked at the Radisson Hotel in the summer of 1989 –which was nearby on the same road!– so the six tower blocks on the "backside" (actually the front entrance) were a revelation to me. If only I'd been interested enough to take photos that summer (or any time before its demolition). My measurements were approximations based on a more-or-less flat view from the side and an estimation of the height of the doors there. I think I need to make the top block a little taller to look more like it consists of two floors and, more obviously, I need to have two rows of nine windows on the front side, not eight. For the surface treatments I painted the base and tower blocks with acrylic and the windows are simply drawings on paper, taped to the sides. Plus, this is a very basic study model and leaves out a lot of nice details like the column tops and the porte-cochere above the back entrance. Fresh and clean and new. This is what it looked like in the mid-to-late 1960s after its completion. 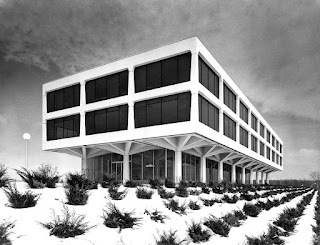 It's so clean and modern, with some great details like the corner cuts and slight lower taper to the office windows, and those nifty umbrella-like radiating supports atop the columns. I've got my work cut out for me to accurately portray this wonderful structure in miniature. My modelling skills are growing with each build, so I know when I'll be suitably ready for this project. 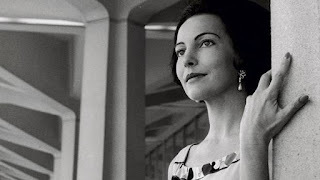 She married into the Bata family and left behind her dreams of becoming a great architect to successfully help develop the Bata company. But look at her: she's so stylish and elegant here that if you told me that she completed her architecture studies and single-handedly designed this building, I'd believe it. I haven't found anything in my research to suggest this, so it's pure speculation on my part, but I like to think she had a big influence on the decision to go with the design (if not having an influence on the design itself) for Bata's head office in Don Mills. 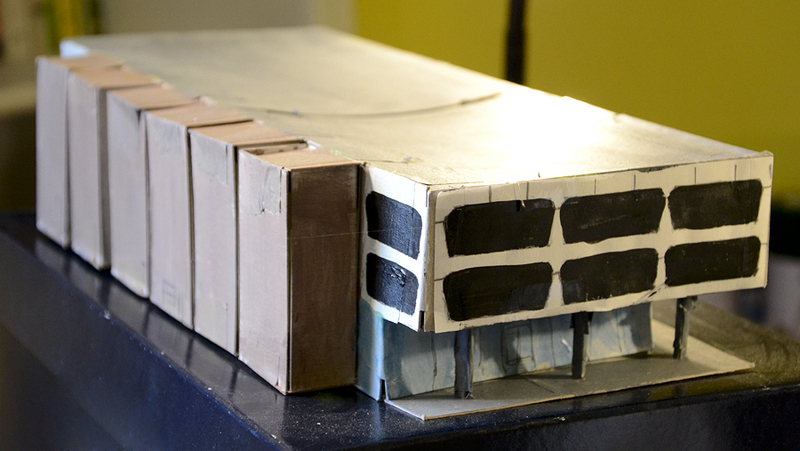 I've since built a more formal version of this model.